Another revolution in innovation - Suzuki launches new DF325A outboard. Suzuki recently held a press conference at the Düsseldorf Boat Show to proudly introduce the NEW DF325A – an outboard that perfectly balances awesome power and thrust, with outstanding fuel-efficiency and trusted reliability all within a lightweight and stylish design. Built with everyday use of larger boats in mind, this market-leading new outboard has been engineered to run on 91 RON fuel and in doing so, is the first four stroke outboard over 300 horsepower in the world to achieve this. The high-tech and innovative DF325A has been designed to be robust, easy to use and versatile, making it the ideal outboard for large boats and any task. 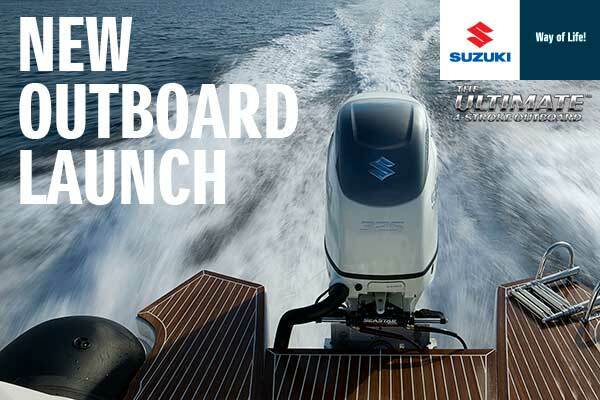 Whether you are using your boat for work or play, wherever you are in the world, this latest addition to the Suzuki range is the ultimate choice as it shares the same revolutionary technologies as the recently launched DF350A. Suzuki’s engineers set out to build a compact, lightweight outboard that delivers the high power required, whilst also maximising operating efficiencies. Additionally, they set the goal of making the DF325A run on low octane, 91 RON fuel, which combined with legendary Suzuki reliability makes the outboard ideally suited for a wide variety of large boats around the world. The traditional single propeller design not only creates forward thrust, but also produces a significant amount of rotational energy. Suzuki’s engineers have captured this wasted energy and turned it into productive power by utilising a revolutionary dual-propeller technology. Suzuki’s engineers know that the lower unit shape and propeller design have a critical impact on performance. The innovative contra-rotating propeller design provides more grip underwater and also helps to achieve a smaller, and far more hydrodynamic gear case. It does this by distributing the engine’s torque evenly over two propellers, so that the torque per propeller is decreased enabling the gear diameter to be reduced. A new three-blade/three-blade propeller set up has been developed to provide incredible acceleration and high performance. In testing, this configuration recorded high speeds even under heavy load and at high rotation speeds. The propeller blade geometry has also been optimised to work in the new configuration resulting in incredible grip and acceleration across the rev range. One of the most remarkable benefits is exceptional directional and transverse stability which is achieved by each propeller rotating in different directions, to balance the turning. Injecting fuel achieves two things: it atomises the fuel and it cools the cylinder. To provide the power and cooling needed, the fuel must be completely injected at precisely the right time and angle. The all-new Dual Injector System uses two smaller injectors giving immense precision, improved atomisation and increased fuel efficiency. With a high compression ratio (10.5:1), more advanced technology is required for the pistons than ever before. Not only does the surface have to withstand greater forces, but the connecting rod and hardware do too. To help the piston withstand the added lateral pressure, a switch has been made from the standard surface texture treatment to shot peening. Shot peening creates fine dimples on the surface that evenly distribute the pressure created during combustion. It’s a more expensive, and a far more involved manufacturing process, but this is what makes it possible to create a piston worthy of the ‘ultimate’ title. Achieving a flow of cooler, dry air directly into the engine is made possible by the unique combination of the Direct Intake System and the Dual Louver System. This revolutionary approach ensures a direct flow of air whilst eliminating water intake, even in the face of the most severe on-water testing. The Dual Louver System incorporates a double shield of blades. The outer row of blades removes the spray from the boat and the inner louvers capture and drain the remaining mist. As a result, intake air is free of moisture and is kept close to ambient temperature. The development of this new outboard has been driven by Suzuki’s belief that it is important to provide boaters with more than just horsepower. While power and speed are critical factors, the added dimensions of efficiency, reliability and stability at this top-end level make the DF325A a welcome addition to Suzuki’s range of ultimate four stroke outboards.